London, for decades the financial center of Europe, finds itself on the brink of a monumental vote. On Thursday, British voters will decide whether to leave the European Union in what’s known as the Brexit referendum. While there is uncertainty over what a Brexit could mean for the UK economy and for London, there is also uncertainty over what it would mean for the United States and for U.S. companies. The Los Angeles Times reports that while the U.S. economy is better insulated than most from the risk of market turmoil, the Brexit referendum has added to uncertainties in a presidential election year and to lingering concerns about China’s economic slowdown. A lot of U.S. companies have something to lose if the UK decides to leave the EU, with the banking and insurance sectors among those most likely to be affected, according to this CNBC report. Some U.S. companies have moved not just parts of their operations but whole headquarters from the U.S. to the UK, CNBC says. For example, the world’s largest insurance broker Aon, relocated its corporate headquarters to London from Chicago in 2012, in a move designed to give the company greater access to emerging markets through London. “If Britain votes to leave the European Union, the innovative center of excellence that has set London apart in the insurance space will be deeply challenged. If companies lose the ability to passport their services into Europe, they may decide to move their European hubs and staff out of London and the UK, which would lead to significantly higher operational costs. The London insurance market has been very vocal on why remaining in the EU is the best outcome for insurers. As Lloyd’s chief risk officer Sean McGovern said earlier this year, the London market is currently the largest global hub for commercial and specialty risk—controlling more than £60 billion ($88 billion) of gross written premium. And the UK’s membership of the EU gives it access to the world’s largest insurance market with a world market share of nearly 33 percent and total insurance premiums of nearly Euros 1.4 trillion ($1.6 trillion). In a recent paper, Lloyd’s, the International Underwriting Association and Fidelis warned that Brexit poses a significant threat to London insurance jobs and business. Read more about the insurance sector impact of a Brexit in this analysis by London law firm Clifford Chance. Aon’s full statement on the EU referendum is available here. The expected $2 billion minimum economic cost of the South Carolina and eastern U.S. floods in early October will place the event as one of the top 10 costliest non-tropical cyclone flood events in the country since 1980. Aon Benfield’s latest Global Catastrophe Recap report, which evaluates the impact of natural disaster events occurring worldwide during October 2015, reveals that already public and private insurers have reported more than $400 million in payouts from the event. Days of relentless record-setting rainfall caused by a complex atmospheric set-up brought tremendous flooding across much of South Carolina, leaving at least 19 dead, Aon reported. The event caused considerable flood inundation damage to residential and commercial properties, vehicles, and infrastructure after more than two feet (610 millimeters) of rain fell from October 1 to 5. Aon noted that the minimum $2 billion in total economic losses from the event includes infrastructure and $300 million in crop damage. Preliminary reports from insurers suggest roughly $350 million in claims. However, additional insured losses of at least $100 million are expected via the federal National Flood Insurance Program (NFIP) and the USDA RMA crop insurance program. A recent article by Insurance Journal noted that the potential exposure home insurers in South Carolina face from the early October event is estimated at $18 billion. That’s according to figures by catastrophe modeling firm CoreLogic. According to the Insurance Information Institute (I.I.I. 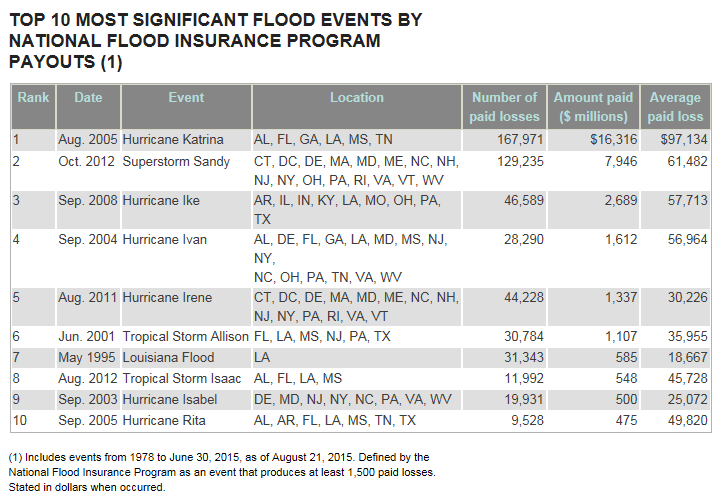 ), none of the 10 largest floods as ranked by NFIP payouts occurred in South Carolina (see below). However, the state was affected by three of the most costly U.S. hurricanes: Hurricanes Charley and Frances in 2004 and Hurricane Hugo in 1989. The list includes events from 1978 to June 30, 2015, as of August 21, 2015. The financial impact of cyber exposures is close to exceeding those of traditional property, yet companies are reluctant to purchase cyber insurance coverage. These are the striking findings of a new Ponemon Institute survey sponsored by Aon. Companies surveyed estimate that the value of the largest loss (probable maximum loss) that could result from theft or destruction of information assets is approximately $617 million, compared to an average loss of $648 million that could result from damage or total destruction of property, plant and equipment (PP&E). Yet on average, only 12 percent of information assets are covered by insurance. By comparison, about 51 percent of PP&E assets are covered by insurance. The survey found that self-insurance is higher for information assets at 58 percent, compared to 28 percent for PP&E. In some ways, these results are not surprising. Cyber insurance is a relatively new product, and while interest continues to increase, it will take time for the purchase rate to catch up with traditional insurances. That said, the values at stake are enormous and as the report states, the likelihood of loss is higher for information assets than PP&E. Another important takeaway from the survey is that business disruption has a much greater impact on information assets ($207 million) than on PP&E ($98 million). This suggests the fundamental nature of probable maximum loss (PML) varies considerably for intangible assets vs. tangible assets, Ponemon says. Business disruption represents 34 percent of the PML for information assets, compared to only 15 percent of the PML for PP&E. A footnote states that while the survey results suggest PML in the neighborhood of $200 million, a growing number of companies are using risk analysis and modeling to suggest potential losses in excess of $500 million to over $1 billion and seek cyber insurance limit premium quotes and policy terms for such amounts. More information on the growth in cyber insurance is available from the I.I.I. here. Some 2,243 individuals involved in cyber and enterprise risk management at companies in 37 countries responded to the Ponemon survey. The number of countries with downgraded political risk ratingsÃ‚ grewÃ‚ in the last year, as all five emerging market BRICS countries (Brazil, Russia, India, China, South Africa) saw their risk rating increase, according to AonÃ¢â‚¬â„¢s 2014 Political Risk Map. As a result, countries representing a large share of global output experienced a broad-based increase in political risk including political violence, government interference and sovereign non-payment risk, Aon said. The 2014 map shows that 16 countries were downgraded in 2014 compared to 12 in 2013. Only six countries experienced upgrades (where the territory risk is rated lower than the previous year), compared to 13 in 2013. Aon noted that BrazilÃ¢â‚¬â„¢s rating was downgraded becauseÃ‚ political risks have been increasing from moderate levels as economic weakness has increased the role of the government in the economy. RussiaÃ¢â‚¬â„¢s rating was also downgraded due to recent developments with the Ukraine and the annexation of Crimea. India, China and South Africa also saw their ratings downgraded. InÃ‚ another key takeawayÃ‚ Aon noted that Ukraine is now rated a very high risk country, as the implications of developments following the annexation of Crimea by Russia and government collapse warranted a further downgrade in political risk. The map measures political risk in 163 countries and territories, in order to help companies assess and analyse their exposure to exchange transfer, legal and regulatory risk, political interference, political violence, sovereign non-payment and supply chain disruption. Hat tip to Insurance Journal which reports on this story here. Flood events continue to dominate natural catastrophe losses in 2013, according to the latest Global Catastrophe Recap report from Aon Benfield. The report reveals that billion-dollar flood losses were recorded in China, Russia, Philippines, and Pakistan during August 2013, causing an initial combined estimate of $10 billion in economic losses. Additional flood events were recorded in Afghanistan, Niger, Sudan, Mali, Laos, Cambodia, India, and the United States. In the U.S., a severe weather event affected the Midwest and the Plains in early August, causing at least two fatalities. The states of Minnesota and Wisconsin were hardest-hit. Total economic losses were estimated at $1.0 billion, with insured losses in excess of $625 million. Excessive rainfall also prompted major flooding between August 5 and 12 throughout parts of five states. More than 2,000 homes sustained flood damage in Missouri and Kansas alone due to inundated basements or backed-up sewers. Additional flood damage occurred in Tennessee, Arkansas and Oklahoma. Total economic losses were estimated by state governments at roughly $25 million. In other U.S. catastrophe news, Aon noted that the Rim Fire became the fourth largest wildfire in California’s history. Check out I.I.I. 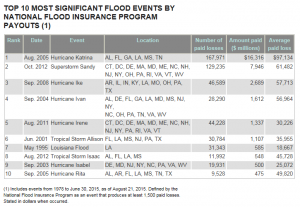 facts and statistics on flood insurance. The number of countries with upgraded political risk ratings has increased, according to AonÃ¢â‚¬â„¢s 2013 Political Risk Map. After several years of greater downgrades due to the Arab Spring, the political effects of the global financial crisis and persistent strains in South Asia, political risk has eased in 13 countries, Aon says. Despite the upgrades this year, Aon warns that businesses operating in emerging markets still face significant political risks. The 2013 map shows that 13 countries were upgraded in 2013 compared to just three in 2012. The 2013 map also shows only 12 countries experiencing downgrades, compared to 21 in 2012. An upgrade is where the overall country or territory risk is rated lower than the previous year. After dominating the downgrades in 2012, three Middle Eastern countries (Bahrain, Oman and UAE) were upgraded in 2013, reflecting a stabilization and differentiation of political risk in the MENA region. Several Central Asian and Caucasus countries Ã¢â‚¬“ Azerbaijan, Armenia, for example, showed improvement, though admittedly from a low base. In Western Africa, Cameroon, Chad and Mali all were downgraded, along with adjoining Algeria, reflecting the spillovers from difficult regime changes in North African which destabilized these countries. The 2013 map measures political risk in 163 countries and territories to assess the risks associated with exchange transfers, sovereign non-payment, political interference, supply chain disruption, legal and regulatory regimes, political violence, ease of doing business, banking sector vulnerability and governmentsÃ¢â‚¬â„¢ capability to provide fiscal stimulus. The map is now online and interactive and can be accessed here. PC360 has more on this story.